California Wine Pioneer Doug Margerum is in the District this week, promoting his incredible Santa Barbara wines to D.C. chefs, educating D.C. foodies and tourists on Rhone wine varieties, and meeting with winemakers from across America to sip and savor around the table. Doug is one of the five winemakers who attended the National Museum of American History’s 6th Annual Winemakers’ Dinner on Tuesday, June 19th. He has an incredible passion for food and wine, which started at the age of 14 when he visited France with his parents. 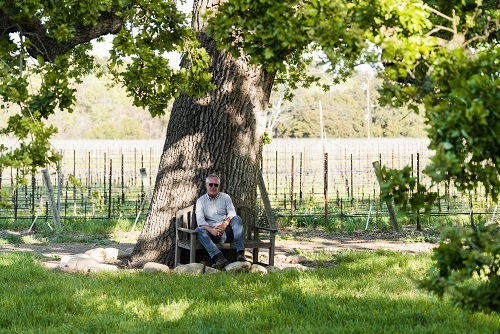 Since then, he has worked in restaurants as a cook and server, began WINE CASK with his family—a wine store and restaurant from 1981 to 2007, owned and founded VITA NOVA winery with Bob Lindquist (Qupé) and Jim Clendenen (Au Bon Climat) from 1986 to 1998, and launched Margerum Wine Company in 2001. Margerum Wine Company started in a tiny 240 square foot cold room in Santa Barbara, and although it has grown exponentially since then, Margerum Wine Company is still the antithesis of mass production. Margerum Wine Company uses high quality grapes in unique soil from the microclimate of their Vineyards to create impeccable wines that have individual personalities. This wine is crafted from Grenache and Syrah grapes sourced from select vineyards including Margerum Estate at Honea Vineyards in the Los Olivos District AVA; Curtis, Estelle, McGinley, Vie Caprice and Portico vineyards in Santa Barbara County, and Alamo Creek Vineyard in San Luis Obispo County. It’s crisp on the palate, with a touch of fruitiness mixed with tannin and verve. This is the perfect Rose for a hot summer day with some fresh seafood. Their 2015 Grenache is a bright, fresh, and fruity wine, sourced from several top vineyard sites throughout Santa Barbara County. Because of the Grenache’s raspberry and rose petal aromas, this wine is perfect for after-dinner drinks with a sweet dessert. We loved meeting with the incredible Santa Barbara winemaker and liked dining with the rest of the Rhone Rangers at the Smithsonian Castle. Along with being a Rhone Ranger, Doug is on the Smithsonian’s National Museum of American History Kitchen Cabinet, an advisory board made up of leaders in food scholarship, culinary history and food-related businesses in America to help expand on the rich narratives of food and beverage. For more information on Margerum Wine Company, including their Wine Club, Tasting Room, Upcoming Events, and their fantastic wines to buy online, go to: Margerum Wines. Esther Mobley of the San Francisco Chronicle gives Margerum Café Red a nice mention! Margerum M5 White makes the cover of Wine Spectator!